There are so many awesome accessories that I want to share with you for the Keurig. I have a whole post coming your way. Until then, Amazon.com has a great deal on a refillable K-Cup. 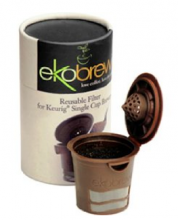 Head over to Amazon.com and check out the ekobrew Cup. It’s only $11.06 today, reg. $16.95. Cam, did you know you can earn the refillable cup with swagbucks!!! I just spent all 10,500 of mine last night and the cup was one thing I got! That is awesome! I rarely look at the prizes since I just save up for gift cards!